When the DC Universe was revamped and relaunched in 2011, Green Arrow suffered. Never a consistent reader of the series, I’ve read many of the seminal works, and saw ‘The New 52’ as a way to jump on for the long haul. Alas, the series didn’t hold my attention, so I quickly removed it from my monthly reading stack. Since then, creative teams have come and gone, but the arrival of Jeff Lemire and Andrea Sorrentino has returned the character to the spotlight. I’d heard whispers that GREEN ARROW was required reading; one of DC’s best monthly books, in fact. So I took the plunge with Volume 5: THE OUTSIDERS WAR, without any prior knowledge of what’s been going on in the series up to that point. An inexorable side-effect of long-form storytelling is that it’s very difficult for a new reader to catch up on what they’ve missed. While THE OUTSIDERS WAR is a standalone arc, it’s heavily affected by events from the previous volume. While Jeff Lemire does a laudable job of trying to catch us up, it’s impossible to do so without dialogue and captions feeling stilted, so he limits his backtracking and for the most part leaves readers to discern overarching plot points. It’s never a major problem, but there were times when I struggled to understand the motivations of certain characters; and when the appearance of a new character clearly lacked the intended impact. 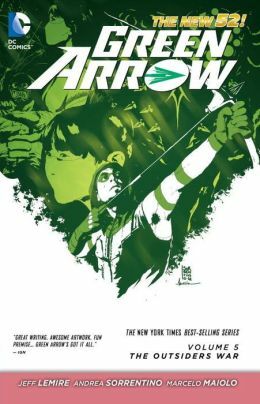 Lemire borrows elements from the successful television show Arrow, but mines new territory, too. THE OUTSIDERS WAR reveals the secrets of Oliver Queen’s past – his stranding on a desert island wasn’t the accident he’d been lead to believe; there were sinister forces at work (aren’t they always). We learn that the Queen family has been embroiled in a war that has perpetuated for generations, involving ancient clans, known collectively as the Outsiders. There are character revelations, fantastically rendered fight sequences, and a conclusion that sets up the next story arc; it’s really just good, fun super-hero comics, benefitted by dynamic artwork from Sorrentino, whose use of color in highlighting specific moments on a panel or page is unlike anything I’ve ever seen.